US President Donald Trump’s surprise visit to Iraq did not include a meeting with Prime Minister Adel Abdul-Mahdi, and enraged local lawmakers, exposing rifts between Baghdad and Washington. Trump made a surprise trip to al-Asad Airbase in western Iraq Wednesday, his first visit to troops in a war zone since becoming president. 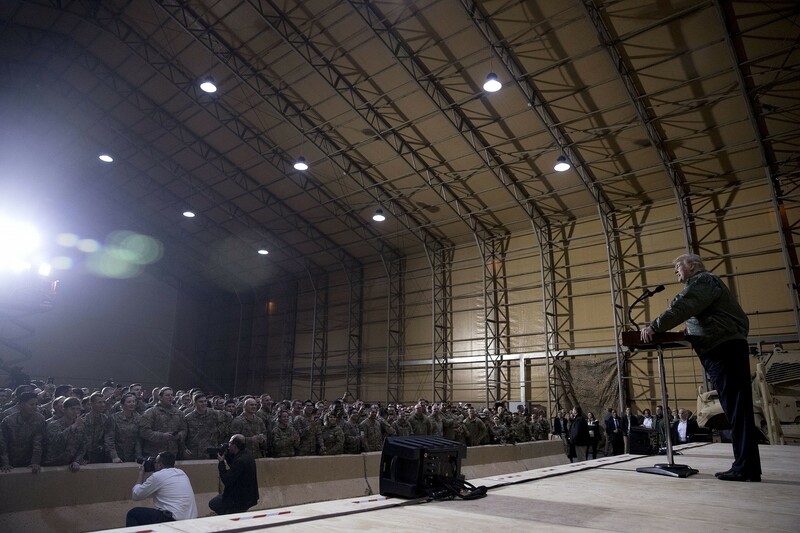 He met with US service members during the three-hour visit, but no Iraqi officials. White House press secretary Sarah Huckabee Sanders said Trump was unable to meet with Abdul-Mahdi because of security concerns and the short notice of the president’s trip to Iraq. She said Abdul-Mahdi had accepted Trump’s invitation for him to visit the White House next year. The premier’s office said in a statement that the two spoke by phone and discussed security issues and Trump’s order to withdraw US troops from Syria over the phone. The statement said the Iraqi leader had invited the president to visit Baghdad, and Trump invited Abdel-Mahdi to Washington. But it did not say whether Abdel-Mahdi accepted the invitation. While meeting with US troops, Trump defended his decision to pull soldiers out of Syria, but said the US military presence in Iraq would remain. Both main blocs of parliamentarians expressed outrage over the unannounced visit and Trump’s vow that troops would remain in Iraq. Khazali is an avowed opponent of the US who rose to prominence as a leader in the Shiite insurgency against the US occupation. He was detained by British and US forces in Iraq from 2007 to 2010. Sabah al-Saidi, the head of the other bloc, Islah, also denounced Trump’s unannounced visit as a “blatant violation of Iraq’s sovereignty,” and called for an emergency session of Parliament to discuss Trump’s visit Wednesday evening. Iraq’s government has close military and diplomatic ties with Washington, though few parties want to be seen as overly close to the US. The Islah bloc is considered closer to the US than the Binaa bloc, which espouses close ties with Iran. Speaking to reporters, Trump grumbled over the need for security precautions and said security concerns forced him to scrap earlier trips to visit US troops in the Middle East. “I had concerns about the institution of the presidency. Not for myself personally. I had concerns for the first lady, I will tell you.” Trump, who made the trip along with his wife Melania, told reporters. Trump, who left unannounced from Washington in the dead of night in a darkened plane, said that a “couple” of trips had been previously set up but canceled as word got out, including one a few weeks ago. Trump had faced criticism for not yet visiting US troops stationed in harm’s way as he comes up on his two-year mark in office. He told The Associated Press in October that he “will do that at some point, but I don’t think it’s overly necessary. On the way home, the president made a second surprise visit to troops, this time in Germany as his plane refueled. Trump and his wife Melania slowly made his way down a rope line at the Ramstein airbase, shaking hands, chatting and posing for photos. Some service members held up “Make America Great Again” caps for Trump to sign. This entry was posted on December 27, 2018 at 10:50 AM and is filed under Uncategorized. You can subscribe via RSS 2.0 feed to this post's comments. You can skip to the end and leave a response. Pinging is currently not allowed.